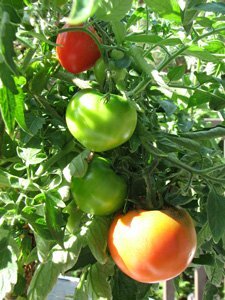 Growing tomatoes - the most popular garden vegetable in America - is easy. With a few tips you'll be enjoying a bountiful harvest of fresh, flavorful vine-ripened tomatoes far tastier than those at the supermarket. In addition to putting nutritious fresh vegetables into your diet, gardening is a fun and stress-relieving activity. You'll have great success in growing tomatoes by following a few key tips. First you'll want to choose a variety that's right for your local climate. There are hundreds if not thousands of varieties and sizes and I'll help guide you on which varieties are suitable for you. I live in Seattle, Washington, which has a moderately short growing season and a cool early summer. But I pick tomato varieties that mature earlier and tolerate cool conditions better than others, so it's entirely possible to have an excellent crop even in Seattle. But if you are fortunate to live in a warm, sun-drenched locale you could even have multiple growing cycles in a year. A convenient, time-saving way to get your starter tomato plants is to buy seedlings at your favorite plant store, but if you want a wider choice of varieties you'll want to start seeds indoors. I give step-by-step details on how to grow tomatoes from seed - it's fun and also economical. They're one of the easiest vegetables to grow. The taste of home grown tomatoes is vastly better than store-bought. They can be grown almost anywhere the sun shines - garden, patio, or window. If you don't have space for a garden, growing tomatoes in containers is a great option because container gardening offers so much flexibility for planting location. I hope you learn something new from the site. Let's start growing tomatoes! Who is Clark? You can learn more about him and why he created this site on About Us.